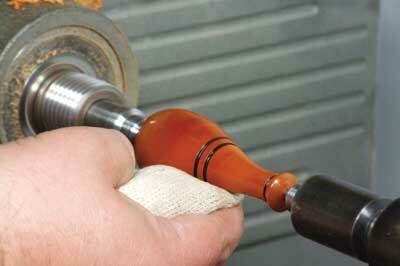 This article is aimed at those new to woodturning but I feel sure there is something here for turners of all levels. Today, we are fortunate to have many products available to us, some of which have become widely available and others only by region. 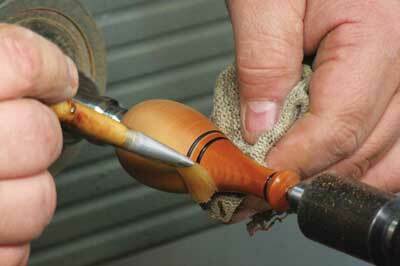 Finishing is a huge subject for woodturning and here I will only touch upon some basic types to get you started. 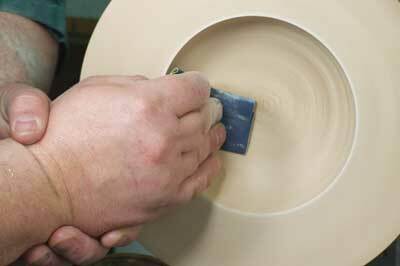 Often the beginner will find it difficult to achieve a satisfactory finish and will use one finish that does it all. This is limiting, however, and does not take into account the different ways that wood needs to be treated depending upon its final use. Is the piece purely decorative? For food contact? Or, will it get a great deal of handling? 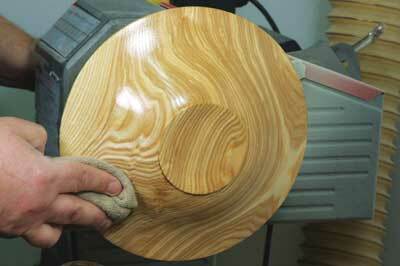 Are you unsure what you want to do with the piece, and do you want to show how attractive the wood grain is in the piece? 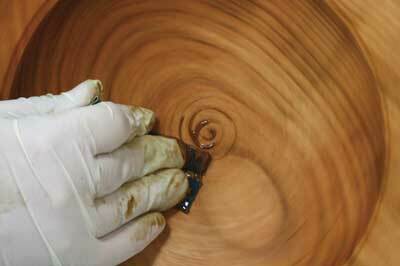 When viewing work it is often the type of finish or standard of finish that lets the piece down. 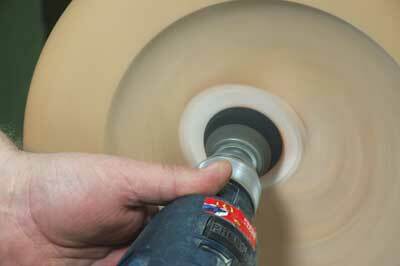 The biggest mistake made by many is to apply too much finish and end up with streaky or patchy finishes along with poorly executed sanding. This article aims to address these mistakes. 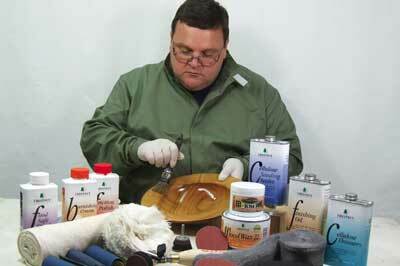 This group includes cellulose, acrylic and shellac varieties. 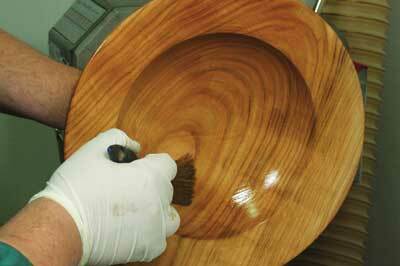 The group also includes pre-catalysed melamine lacquer, which is a water resistant sealer. 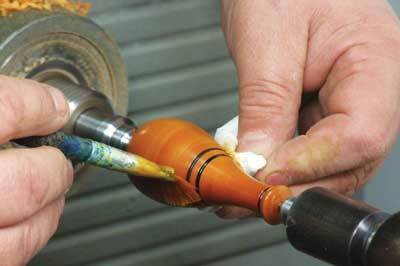 These are used to seal the wood before applying a finish, but they can also be used as a final finish in their own right. Sanding sealers are diluted 50% using the appropriate thinning agent to allow application over larger areas whilst staying wet across the entire piece, also allowing it to flood into details. If undiluted it is often impossible to get an even coverage with the product straight from the tin. 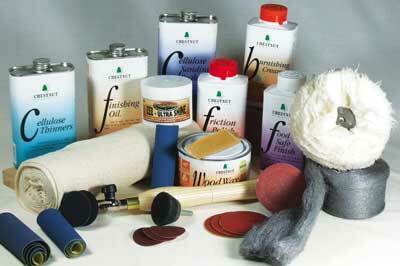 These come in different types, such as soft paste waxes, hard stick varieties and can be coloured. 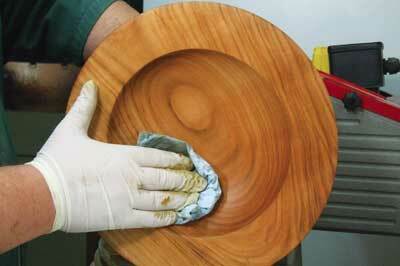 These are usually best applied over a sealer, but some new types can be applied to bare wood. 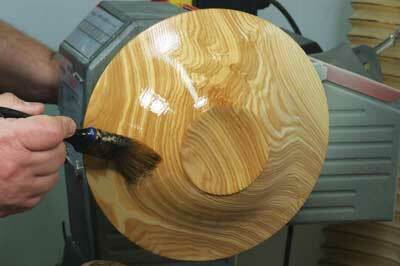 Lacquers and oils fit this section well. 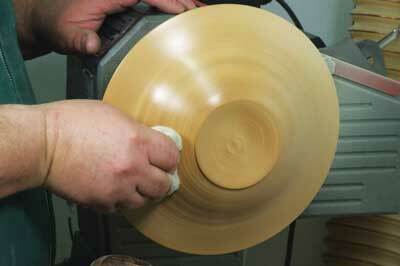 Some can penetrate the timber; others form a surface finish and come in gloss, satin or matt sheen. Oil is deemed to be one of the most durable but not necessarily the best at resisting finger marks and dirt contamination. 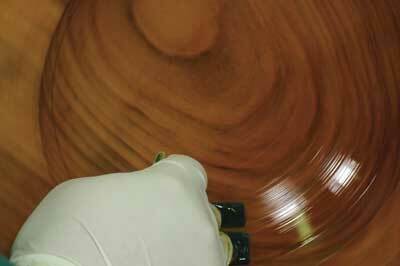 A type of finish that will modify or change the appearance of the wood. On some occasions it may totally cover it to a point where it no longer looks like wood. This complex group includes coloured stains and waxes that are applied to bare wood along with chemicals, such as bleach. If the piece comes into contact with food then it has to be food safe and that means it must comply with current government standards (if these are applicable). Alternatively, you could use pure beeswax, vegetable/mineral oil or liquid paraffin, all of which are applicable, plus many other manufacturer specific types of finish. These should be treated as another cutting tool and you really do get what you pay for where these are concerned. 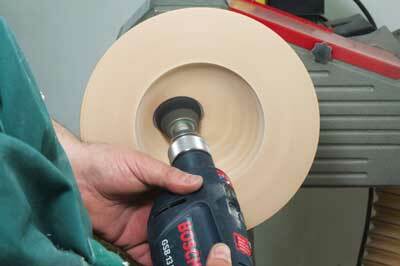 Good quality abrasives are not cheap; they need to be cloth backed and flexible and must not crack when folded. These are usually made of aluminium oxide and are heat resistant and waterproof to some degree. 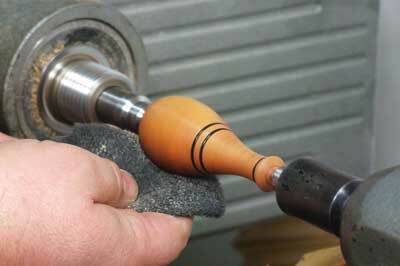 The grades I use are 80, 120, 180, 240, 320, 400 grit. 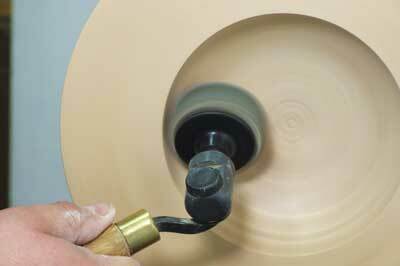 I invariably start sanding at 80 grit because my turning tools are sharpened on a dry grinder that is fitted with an 80 grit white aloxite grinding wheel, which produces 80 scratches per inch along the cutting edge. 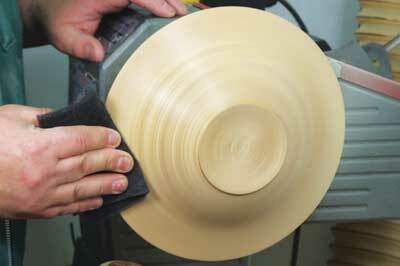 80 grit abrasive will remove any lumps and bumps from the workpiece very quickly. When working as an apprentice stonemason polishing granite I recall that if you missed one grade you had to start all over again - there are no short cuts to the perfect finish. Some say cloths, some say papers, but I use both depending upon the job in hand. Mutton cloth is used for applying sanding sealer and polishing waxes, whereas paper is used for friction polish and oils. But remember that all paper cloths have an abrasive quality of their own, so it may take time to find the right one for you. Start with a good quality kitchen paper towel, but ensure to NEVER wrap any polishing cloth or paper around your fingers. Also, never allow loose ends to trail around rotating machinery or work. 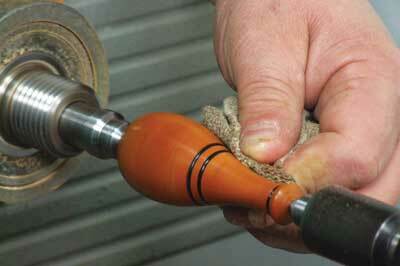 0000 wire wool is used for cutting back finishes and sealers. Nyweb and Webrax are artificial forms of wire wool that do not degrade as readily as wire wool and do not leave debris behind as they are used. 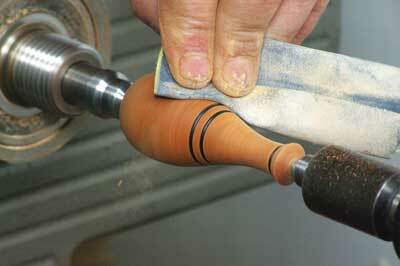 The Basic method for finishing is to sand, seal and then apply the finish. 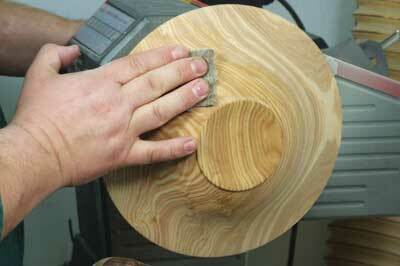 When you are using oil, however, there is some change in this method. This product is often misused by beginners and should only be used on small items, such as light/cord pulls and bottle stoppers. Most manufacturers state that no sealer is required but I find this is not the case - you can achieve a far superior finish when using one.